The RetroSound R-TB8 is a ported full range speaker enclosure. These wedge shaped speaker boxes work great behind the seats of trucks, SUV's, hatchbacks and coupes. They feature an 8-inch bass driver for great low frequency response and soft-dome tweeters for smooth, clear highs. They are finished in a durable gray carpeting and have chrome speaker terminals. Power handling is 175 watts. 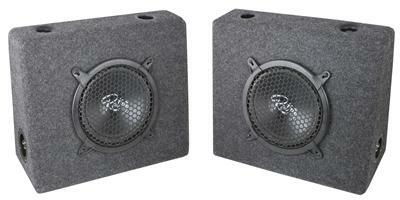 Price is per two speaker boxes, one for the driver's side and one for the passenger side.